Making your own mixed peel is a breeze. It takes hardly any time at all but is a process that is completed over two days. Now’s the time to be making it. Backyard citrus trees are laden and christmas cake making time is just around the corner. I’ll be making my christmas cake next month so it can mature fully before it’s devoured! So here’s how I make mixed peel. 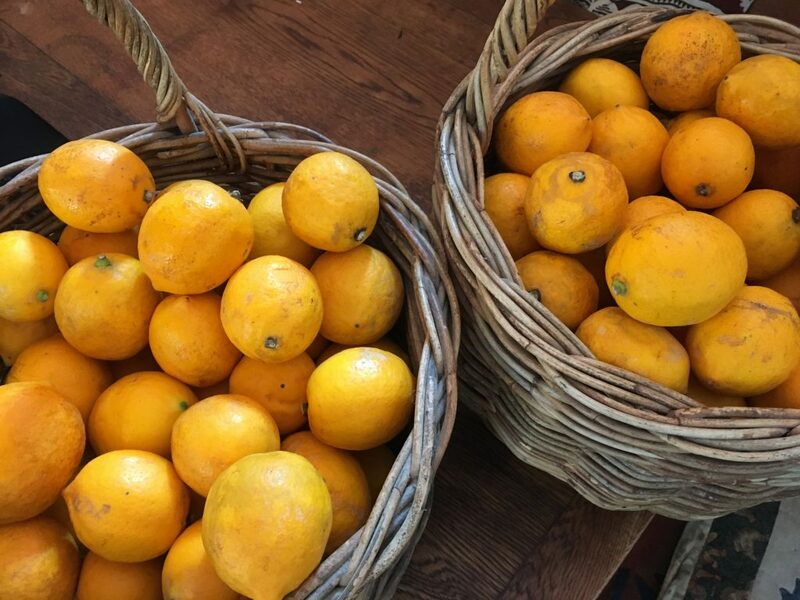 You can use any citrus that you have; limes, lemons, grapefruit, oranges or tangelos. Peel the fruit in strips about an inch or so wide, leaving as much of the white pith on as you can. Cut the peel into approx 1/4 inch wide pieces. Now place the chopped citrus peel into a saucepan. Just cover the fruit with water. Bring to the boil and reduce to a simmer for 10 minutes. After 10 minutes of simmering, drain the water off. Repeat the process by putting the peel back into the pan and add enough water just to cover. Bring to the boil, reduce heat to a simmer and cook for another 10 minutes. Drain the liquid off again but this time reserve 1/2 cup of the liquid. Pour the reserved liquid plus 1/2 cup water and 1 cup of the sugar into a saucepan. Gently bring to the boil, stirring to dissolve the sugar. Once the sugar mixture has come to the the boil pour over the peel and leave to stand overnight. Come the next day, place the peel and the liquid, and the remaining 1/2 cup of sugar into a saucepan and stir over a low heat until the sugar dissolves. Bring up to the boil and reduce heat to a simmer, continuing to simmer for 15 minutes. Spread the peel out on grease proof or brown paper and allow to stand overnight to dry. Occasionally move the peel about with a fork to keep them separate. If storing your mixed peel in the fridge, it will last for about one month. If you want to keep for longer you can freeze in little snap lock bags. Perfect for Christmas cake and Easter hot cross buns. I’ve since made these. I tripled the recipe and used grapefruit, tangelos, oranges and lemons. Posted in UncategorisedTagged buns, citrus, cross, hot, lemon, mixed, orange, peel. Thanks for the great recipe. I have issues with Free-Glutamates and MSG. My peel looks fab and tastes lovely can’t wait to put in in my Christmas Cake. Thank you soooo much for posting this simple, but most effective method. Each batch comes out wonderfully. If spread and separated on a sheet pan and put into the freezer and later portioned into cling warp packets and then into a Ziploc bag, it keeps wonderfully well in the freezer for weeks on end! Thank you for this recipe – just making a batch now for my Xmas cake. I could not find it in the stores here in the USA. Thank you!!! How wonderful to find a easy way to have really good candied peel. So hard to find uncut peel in supermarkets .Making special wedding cake ! I’ve kept mine in the freezer for 6 months and it is just fine. I find that it needs more sugar to balance the remaining bitterness in the peels. Forking it over and sprinkling lightly more granulated sugar accelerated the drying. Additionally, I laid the peels in my oven on the lowest setting to insure a lower moisture content for storage, about 2 hours. I am pleased with the consistency and taste, and expect it will keep quite a long time. Thanks for the recipe. I used double all the ingredients (5 oranges and 5 lemons) and the peel weighed 348g at the start and 353g at the end. So using 5 fruits like in this recipe you would get about 175g of mixed peel at the end though it would depend somewhat on the combination of oranges and lemons as lemons are smaller. Tastes delicious! I’ve been wanting to try making Welsh cakes for the hubby, who has been longing for them. Didn’t know exactly what mixed peel was, and certainly could not find any in our stores. 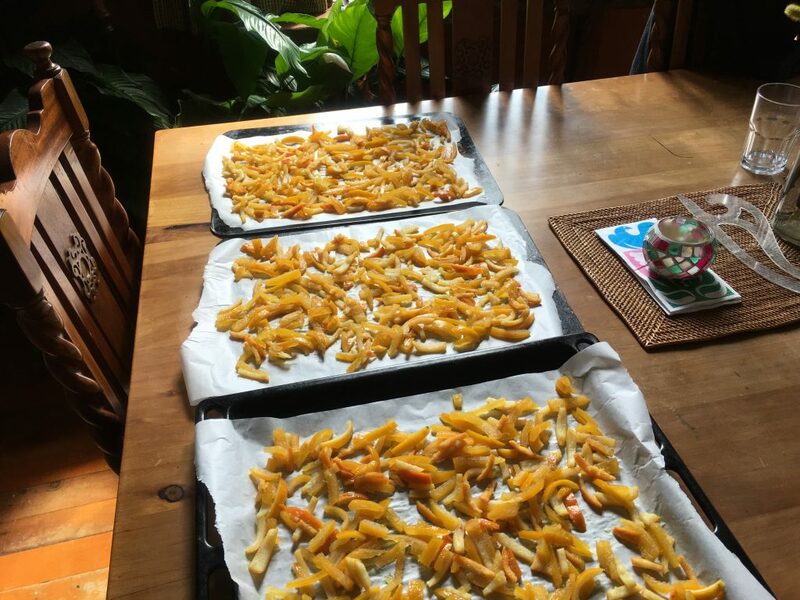 I was so glad to find this recipe, and am now waiting for the peels to dry. I’ve used navel oranges for their nice, thick peel, and also limes from our heavily laden lime tree. I’ve also retained the final syrup for use. Thank you !!! Hello – just a quick question. When it stands overnight in the liquid and then again on the paper, is it refrigerated or at room temperature? Thank you! I removed the white pith but followed the rest of the recipe and the results are perfect, loved it. I then thinly sliced the fruit and placed in leftover syrup, bought it to the boil and then bottled the fruit to enjoy another day. Will this work with Splenda? Hi Eileen, I have no idea about the splenda. I’ve never used it. Maybe make a very small batch using splenda and see how it goes? but what to do with the sugarliquid of the peel? Hi marian, I usually discard the syrup. If you’re using it in to decorate the tops of cakes, would you cut it into chunks after peeling or after drying? I would cut it before drying as you probably want all the cut edges to be candied. Thanks! Since the pieces are smaller, do you think they’ll need less time simmering then? The time is more about getting the syrup right to candy the fruit. Can this be used in fruitcakes ??? absolutely! I use it in fruitcakes and hot cross buns.